The predella [base-section] of St. Jarlath's stained-glass window in St. Mary's Church, Ballinrobe, County Mayo tells a story from his life. The drawing for this piece is signed by Harry Clarke and the window was installed in 1925. He titled it "St. Jarlath teaching SS Colman and Brendan". 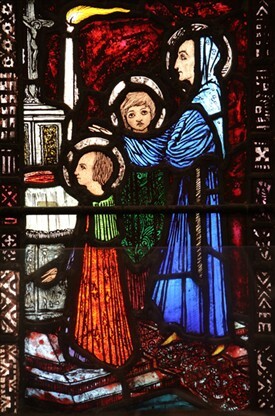 Clarke came to Ballinrobe in December 1925 to see the window in situ at St. Mary's. Deep rich jewel-like colours of scarlet, greens, orange, gold, silver and periwinkle, together with interesting details of the rich Turkish style carpet on the marble steps are worth viewing. The candle flame blows towards the figures representing the gift of a spiritual blessing. 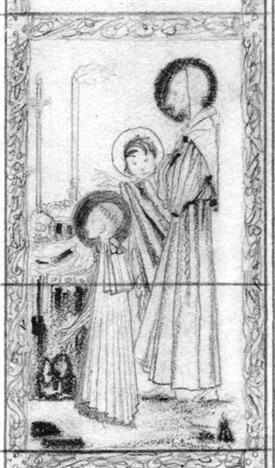 One figure's hairstyles display the 'Roman style Tonsure' in the original drawing, however the 'Irish Tonsure' appears in the finished panel. Another difference is that no tabernacle appears on the drawing but quite an elaborate one was created for the finished window. The detail in this panel is well worth a visit. Suggestion: Bring small binoculars to get an amazing view of details. 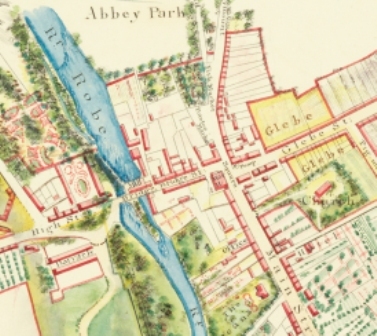 This page was added by Averil Staunton on 10/03/2015.